Charge: Violation of the Laws and Customs of War: 1. Did willfully and unlawfully brutally mistreat, abuse and torture PWs. 2. Did willfully and unlawfully withhold and misappropriate rations and Red Cross supplied intended for the PWs. Reviewing Authority's Recommendations: Accused was a civilian guard. Accused was the guard identified as committing these specifications sometimes due to infraction of the rules such as gambling, theft or suspicion of theft, being unable to count in Japanese. Other times, accused committing acts without any reason, in some instances due to inebriation and others due to impatience with the prisoners. In several occasions, accused instigated the affair and was responsible because he outranked the other Japanese civilians and "whatever he did was accepted and followed." 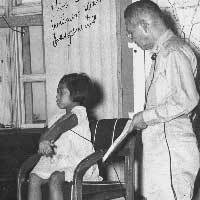 Reviewing Authority: Accused was seen striking prisoners on several occasions but only with his hands and as ordered by the camp commandant or due to his short temper: it is not permitted in Japanese Army regulations to strike subordinates for infractions but it is "customary" to do so. Accused stated that he slapped PWs for infractions rather than reporting them to the commanding officer was that the punishsment would have been more severe for the PWs: he followed the Japanese Army custom. Accused did not commit the acts alleged by the specifications nor did he recall any of the names of those whose testimony was used against him. Accused was a conscientious worker and classified as the best civilian guard. Accused looked after the welfare of the prisoners beyond what duty called for and had a good relationship with the PWs. Prosecution Arguments: The record is legally sufficient to suppoer the complete findings of the commission. The testimony of eye witnesses and the affidavits of prisoners who had been interned at the camp and "were in a position to know the facts of the matter" was used to firmly establish the guilt of the accused except in specification 17. In that specification, the affidavit given to the defense prior to trial charged an offense allegedly committed approx. 15 months before the time set forth. The "result of such inaccurate pleading and presented evidence obviously placed accused in the position of not having a chance to defend himself;" therefore, that finding of guilty is disapproved. There was no evidence before the commission that accused was not sane at the time of the alleged commission of the offenses and at the time of trial. Judge Advocate's Recommendations: 1. Defense had objections which the reviewer addressed concerning the vagueness of specivfications and the repetitious nature of specifications. Page 516 of Reel 1.